I have visited with the local Ashlander tribes to obtain their permission to test myself against the Nerevarine Prophecy. They are a nomadic order and a proud people. Undoubtedly locked in a parochial society that has allowed very little change in hundreds maybe thousands of years. That they should be dictating affairs in any part of the Empire is anathema to any citizen who believes in order over chaos. Still their resolution to keep to their own ways merits some admiration. If only the choice to leave the tribe did not also result in being cast out by your entire family. Some choice that is. Most of this land is so blighted and bleak, I say let them have it. But they must accept an Imperial presence, if for no other reason then for the few that wish to leave the tribe. That one girl I met, the apprentice to a Wise Woman, would she have made it out if I hadn't happened to have offered her master an honorable solution to rid herself of a troublesome apprentice? I am proud to have assisted her when her tribe could not accept her questions though and I am sure Skink-In-Trees-Shade will make room for her at the Mages guild in Sadrith Mora. On the orders of Caius Cosades I traveled to a Sixth House base, north of Gnar Mok. 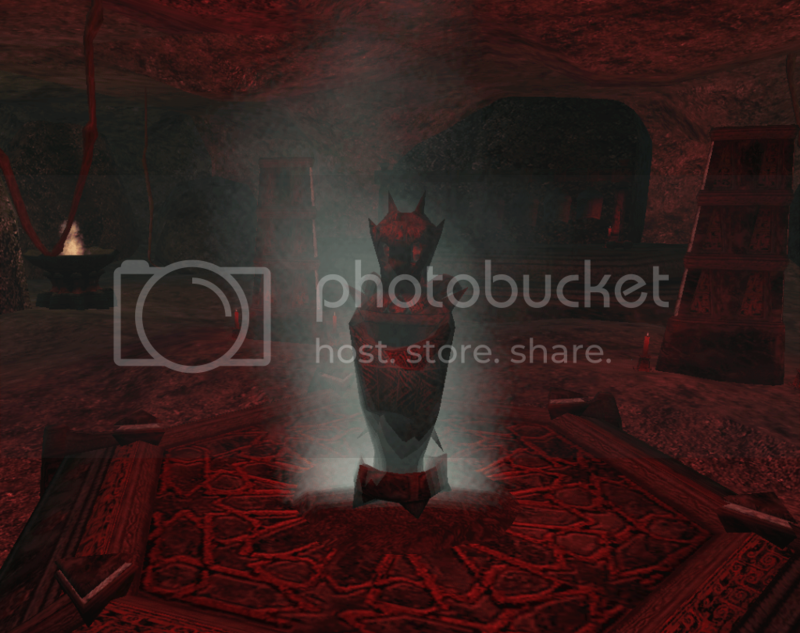 There, in the endless caves of Ilunibi, I slew Dagoth Gares a self-proclaimed 'minister' for the Sixth House. But it seems he may yet kill me as with his last breath he infected me with the Corprus Disease. Caius is sending me to Tel Fyr for a cure, but I have little hope - everyone knows Corprus Disease is incurable and I have seen and fought the walking dead I will turn into. Such an ignoble end to all my plans. I am so angry I could spit! 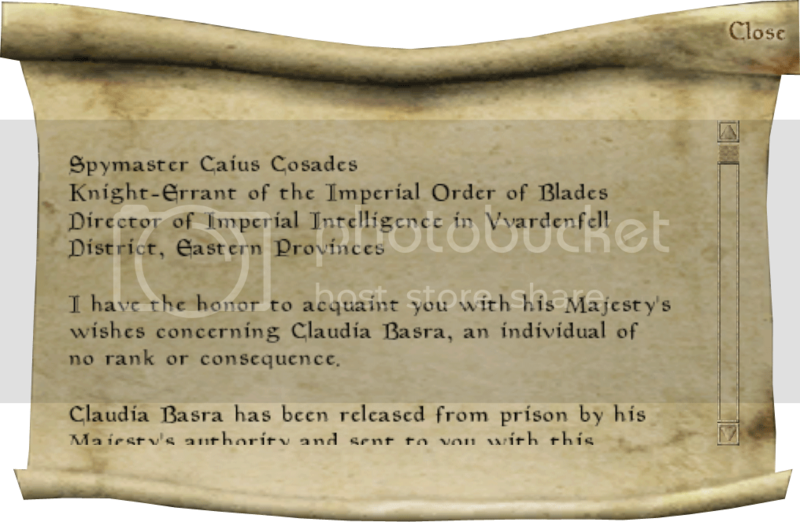 Caius finally let me see the decoded message I was carrying from the Emperor to him, the first day we met. 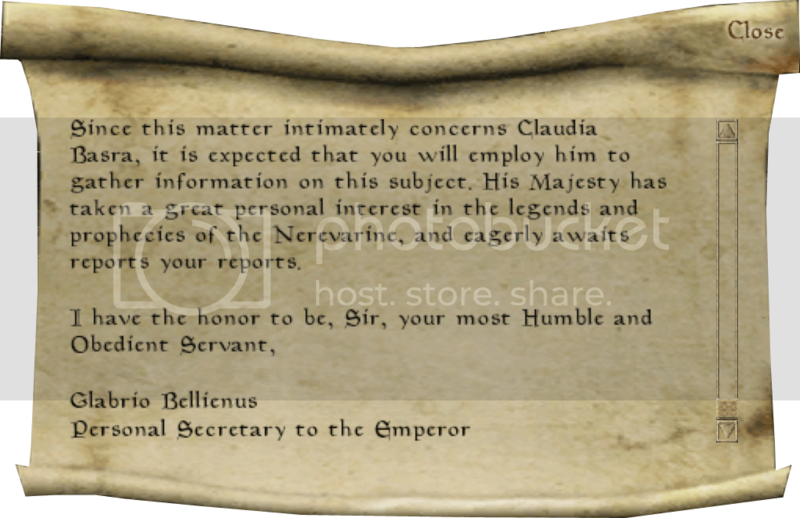 From the letter it seems that the Emperor and his advisors, and most particularly one Glabrio Bellenius, the personal secretary to his Majesty, have divined a citizen on the Empire that fulfills the requirements for the Nerevarine prophecies: Me! Except I do not! The prophecy specifies that the person be born under a certain sign to uncertain parents which is a complete fabrication. I know exactly who my parents are and so does Bellenius! I would have gladly kept his secrets. I always intended to take them to my grave. Not for the sake of his precious honor but for my mother's shame and how deeply it would cut my father's heart. Instead Bellenius does this? Has me thrown in prison and then packed off to Morrowind to die among savages and ash and blight all when he does not even know for sure if he sired me or not! It seems even likely that most of this letter was taken in dictation and later altered to mention me by name but not, as it were, by the correct pronoun. I should take ship, back to the Imperial City. Confront this weasel with my blade and cut the truth out of him but I sense his plans in this. This is why I was chosen to be a part of this elaborate scheme. The Nerevarine! Hah! A scam to satisfy the unruly superstitious locals. A bloodless coup if successful and a small price if I fail. But I will have eye upon me the whole time. The Blades and Cosades, watching my every move. Should I try to return to my home will I not find my family paying the price for my fury? My little brother. Justinian is still just a boy. Would he live to see another dawn from the moment my foot touched a deck headed for Cyrodiil? 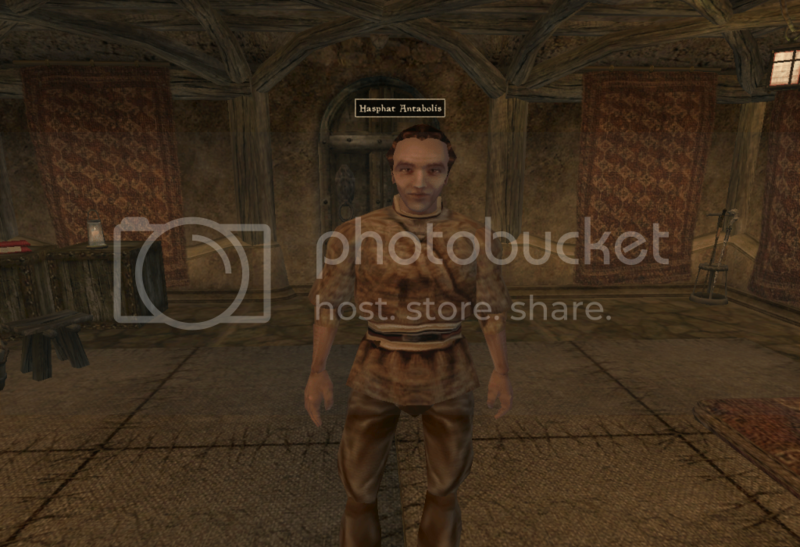 So I continue this charade and play the Bellenius' orphan Nerevarine. And when I'm done I will slip away in the shadows and hunt down this man whether his blood runs in my veins or no man or god or demon will stay my blade. A Name From the Past? I have been inducted into the Thieves Guild and am already quickly rising through the ranks. 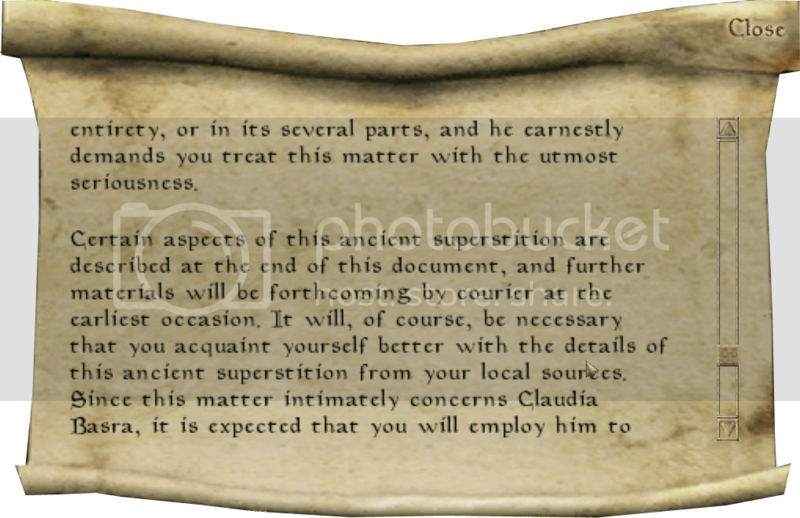 I would like to say that it was on merit alone but it seems my family name holds some sway with the thieves, even here in backwater Morrowind. How strange! I should have liked to have pressed the footpads for the why of this, but it seemed more prudent, for now, to nod sagely and say nothing. 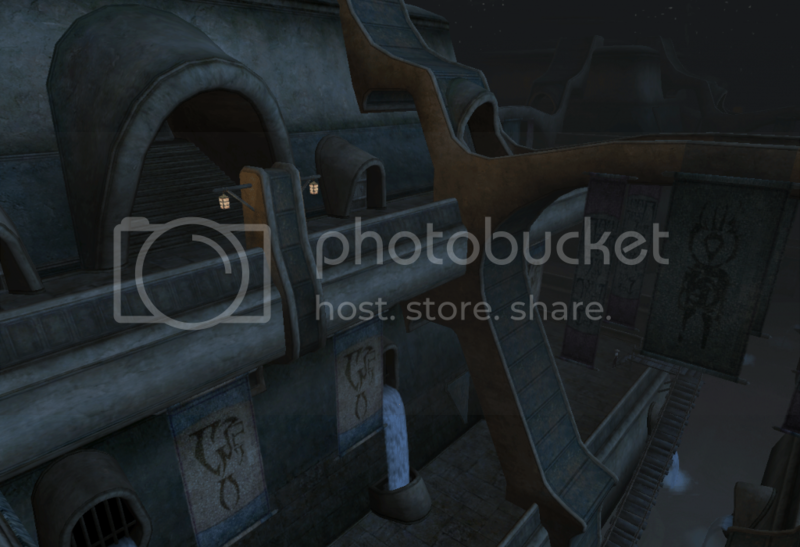 Meanwhile Caius has me tracking down three people in Vivec: A Khajiit, an Argonian and a Dunmer priest. I should have them all walk into the same ale-house and bring an old drinking tale to life. Caius also wants me to cultivate a cover for all the traveling I am doing for him. It would seem my father's insistence that I study with the mages will finally pay off. If I am to travel all over this mud-ball I may as well do so in style and nobody travels like a mage. (you may have to click it to get a decent view of the image. Here is a direct link to the image in it's original size as well: House Basra Preliminary Generational Tree. I have been attacked twice by assassin's in strange garb. They bore no identifying papers or marks and I do not know why they seek my death. It is possible they are members of the Dark Brotherhood? But who would want to offer that much coin for my death? Meanwhile Caius has me running errands for people all over Balmorra. 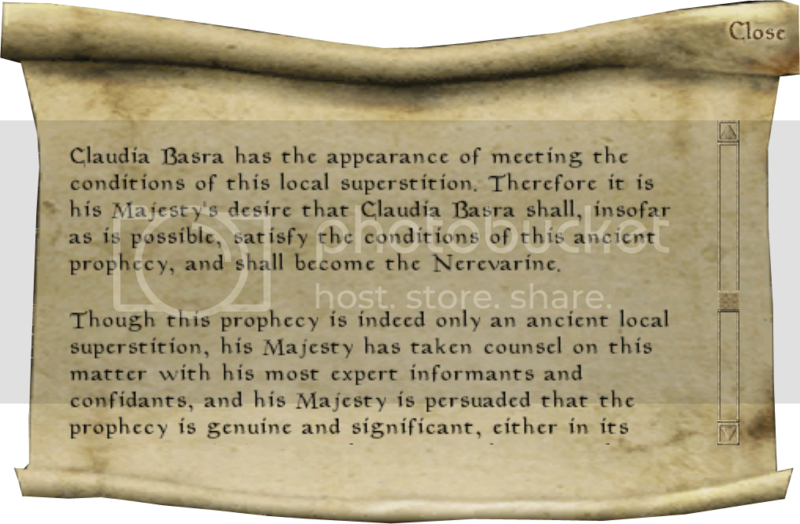 Digging up reference to some old, destroyed "6th House" and a local prophecy about a return of Nerevar. Codswallop if you ask me, but I'm getting paid and for once the weather is holding. I was accosted by a grimy Dunmer proclaiming himself a "Sleeper". The inflection indicated it meant something to him, a title maybe. He informed me, quite pompously in fact that a Dagoth Ur had need of my services.I suppose not all of the 6th house were slain after all? Though I do not understand this reference to 'Sleeping'. I also don't know what he wants with me. It appears that much of this Nerevarine prophecy has to do with ousting all outlanders from Morrowind and giving power back to the natives. Insulting! Here the Empire has blessed their dusty swamp island with decent roads, strong forts, healers, organised guilds and now they want to keep all this and send the givers and builders away? While watching some E3 videos yesterday, a (much belated) penny finally dropped for me. The Elder Scrolls Online will be taking place before Morrowind, Oblivion and Skyrim (look I'm not even going to talk about Daggerfall or Arena so don't even start with me!). 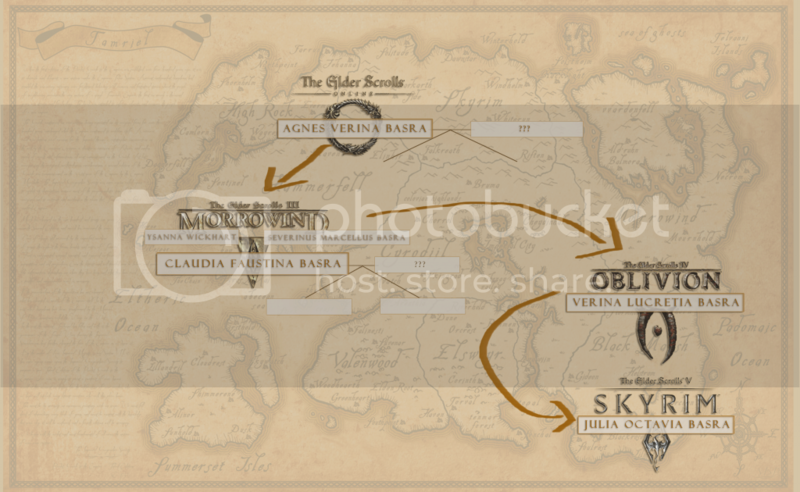 The Second Era - Includes the rule of the Akaviri Potentates, and the 400 year time period known as the Interregnum. It is also known as the "Common Era". The Elder Scrolls Online will take place in this era. The Third Era is the Empire of Tamriel, ruled by the Septim Dynasty, and lasts 433 years. 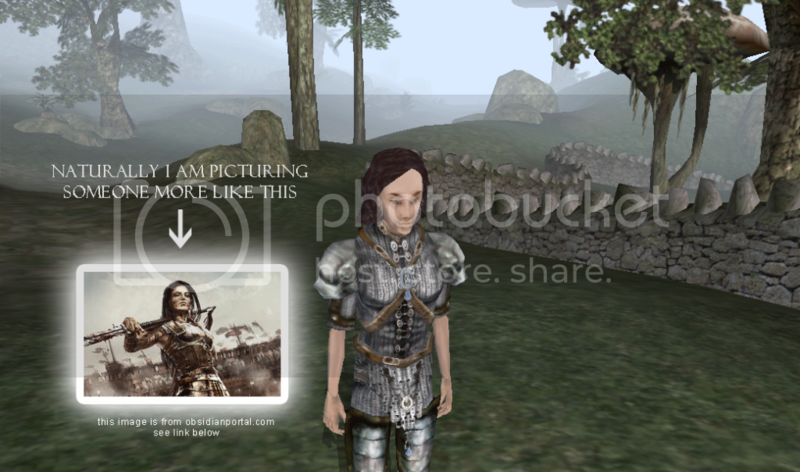 Arena, Daggerfall, Morrowind, and Oblivion all take place during this era. I'm running errands all over for the Balmorra Fighter's, Mage's and Thief's guilds (say that 10 times really fast without wiping your chin, I dare you!) before progressing the main story line further. In the meantime I kept running into one bleak, rainy day after the next. Finally, in Pelagiad (where the sun always shineth? ), I was able to grab a screenshot of my first ancestor in some decent light. I intend to stick with the dark hair, dark eyes combination but fiddle with colours within that spectrum. So one ancestor could have dark hazel eyes and another a dark solid brown and so on. Normally I would be rolling red heads but Basra had black hair in SWTOR too, so I guess it's a trend now. Will I share House Basra?